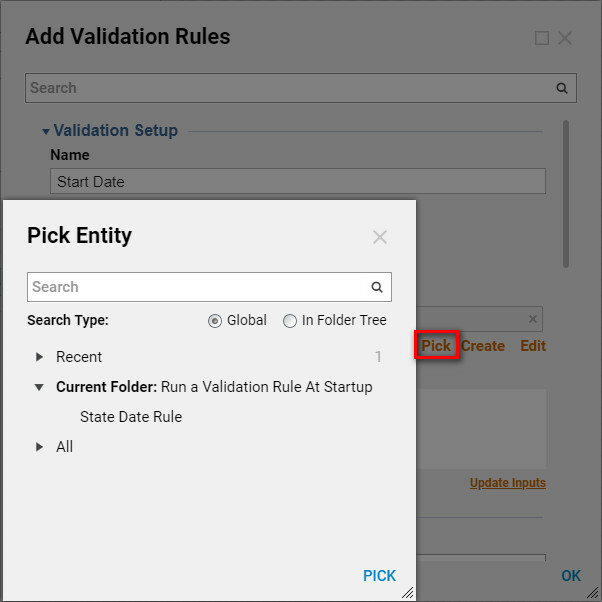 To ensure that a user enters valid data in a form&apos;s required fields, you can configure a form to run validation rules when it opens and to display alerts next to the fields. This can be useful for highlighting form fields that must be changed because their default values, or values inherited from a preceding step, are invalid. 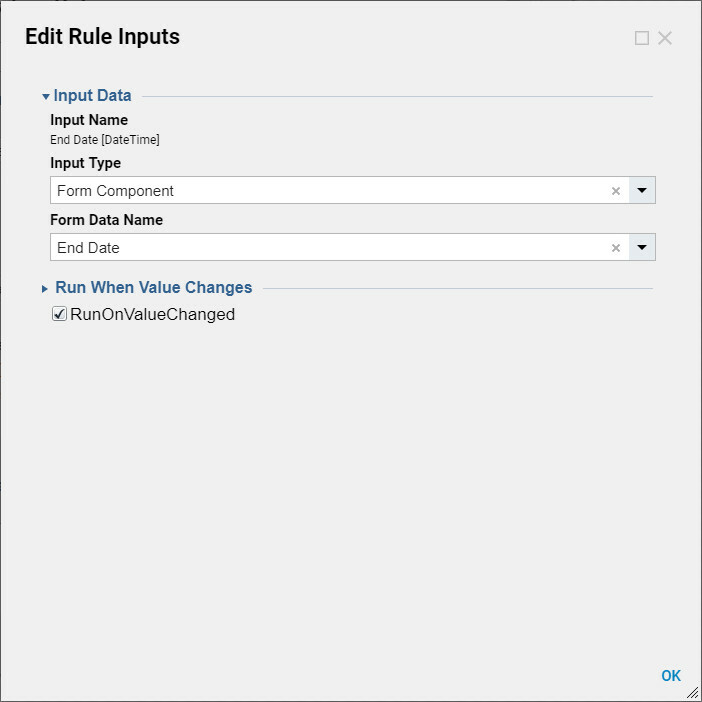 The RunRulesAssumingOutcomes	form property enforces the validation rules for a specified outcome when a form opens. Add it to a form in the Properties	panel, under the section Rules > RunRulesAssumingOutcomes	, by selecting the Finish	checkbox. 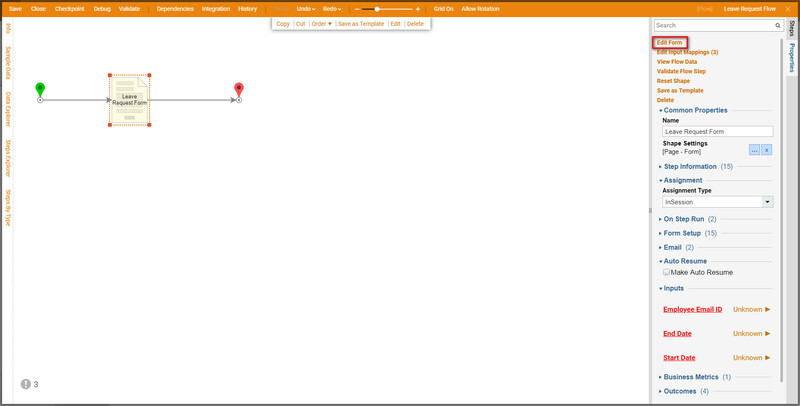 Our example flow will contain a single form step. This form Leave	Request	Form	will have four fields: Employee EmailID	, Select Leave Type	, Start Date	, and End Date	. All four form entries will be required values. In addition, the custom rule Start Date	will be hooked into our form, requiring that the Start Date	be earlier than End Date	. These rules will be enforced at startup, so that if any field is in error, it will be highlighted when the form is instantiated, rather than only when it is submitted. 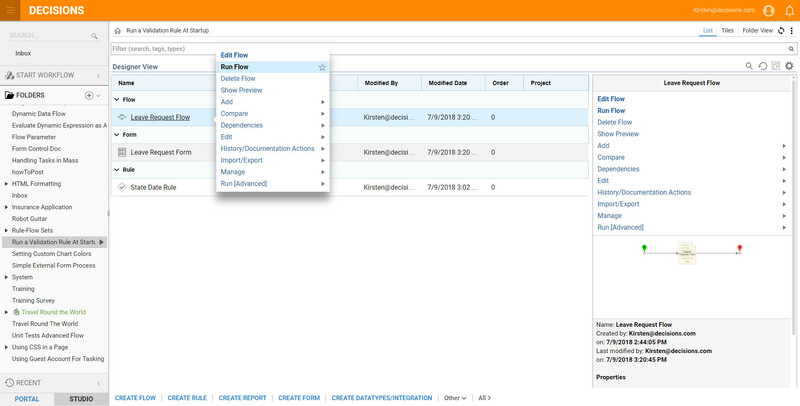 We&apos;ll begin in the portal by navigating to our project folder and clicking the Create Flow	button. 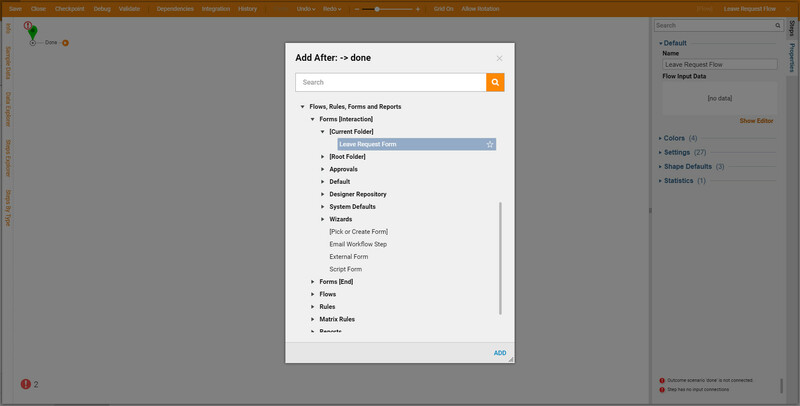 We&apos;ll give the flow a name and click CREATE	to open it in the Flow Designer . In the Flow Designer&apos;s start-up window, in the category Flows, Rules, Forms and Reports >	Forms [Interaction] > [Current Folder	]	, we select a Leave Request Form	component and click Add	to add it to the workspace. Next, we&apos;ll connect the outcome paths in the flow. To add the Start Date	validation rule to the form, we select it in the workspace and click the Edit Form	link in the Properties	panel. This opens theLeave Request Form	in the Form Designer . Expand the Properties	panel. 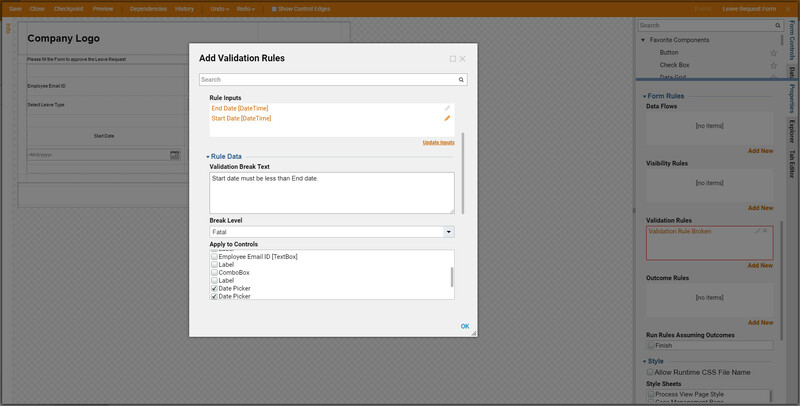 In the section Form Rules > Validation Rules	, we will click the Add New	button. 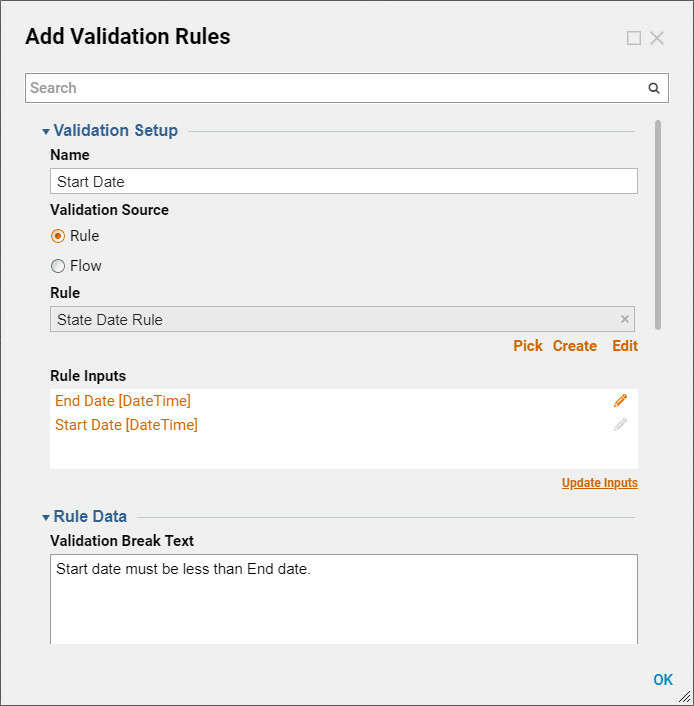 In the resulting Add Validation Rule	dialog, configure the details for the custom rule. Name the rule then in the Rule	drop-down list, select Designer Folder > Start Date Rule. Next, we will update the message that is displayed when this rule is broken by changing ValidationBreakText&apos;s	value to "Start date must be less than End date." Next, we will configure our rule to apply to the appropriate controls in the ApplyToControls	list by checking the checkboxes for both Date Pickers. 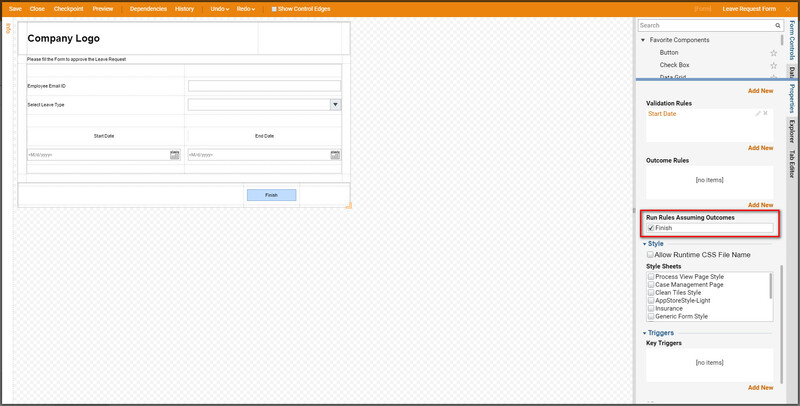 To configure our rule inputs, we will select the first input Start Date	and click the Edit	button [pencil shaped icon]. In the resulting Edit object pop-up, we will change Start Date&apos;s	input type from "InputData" to "Form". 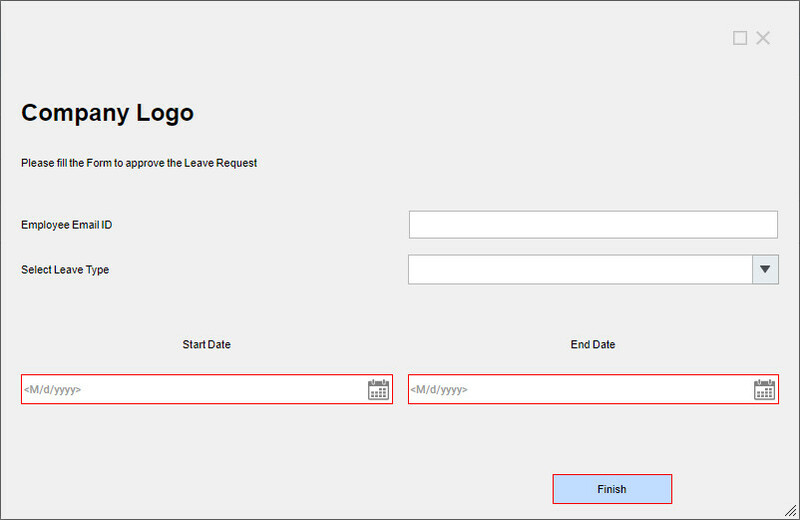 Then define the form element which will serve as the Start Date	input by selecting theFormDataName	"start date". This completes our definition for the Start Date	input, so we will click the OK	button to close theEdit Rule dialog. Next, configure our rule&apos;s second input by selecting the second input End Date	and selecting the Edit	button. In the resulting Edit Rule dialog, change End Date&apos;s	input type from "InputData" to "Form Component". 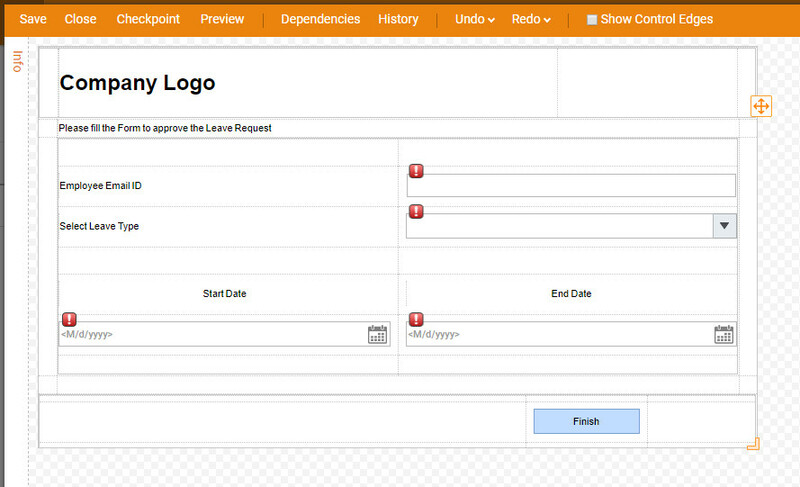 Then define the form element which will serve as the End Date	input by selecting the FormDataName	"end date". This completes our definition for the End Date	input, so we will click the OK	button to close the Edit Rule dialog. This also completes our configuration of our custom rule - Start Date	- so we will click the OK	button to save the configuration and close the Edit object pop-up. If we were to save our form now, Start Date	would be run every time we submit it via theFinish	button. 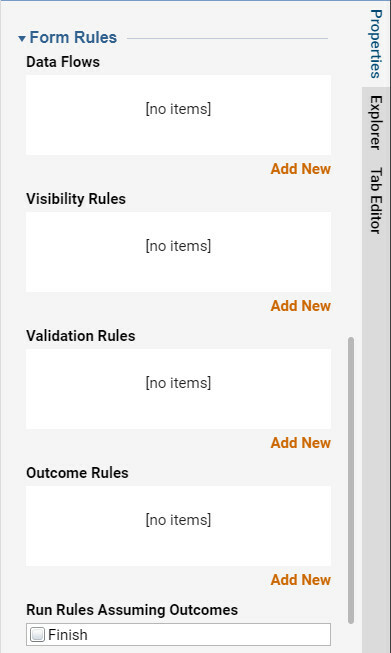 To run this rule at startup, we will go to the Properties	panel and, under the heading Rules > RunRulesAssumingOutcomes	, check the box next to the Finish	outcome. This completes our form. We will click the Save	link at the top of the Form Designer to save it. Close	the form. This also completes our flow, so we save the flow and close the Flow Designer . 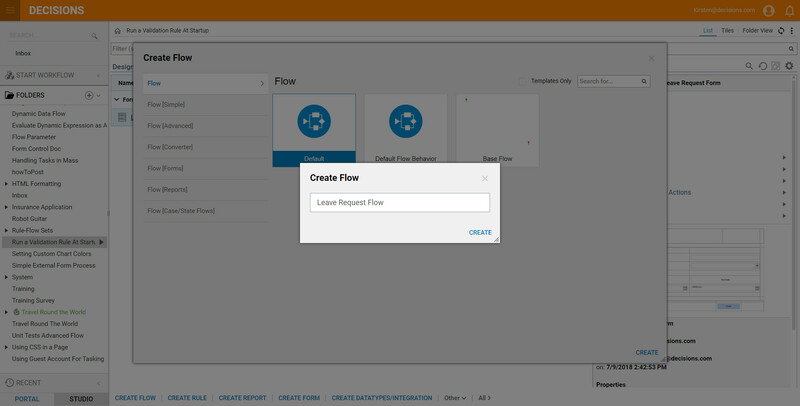 Back in our project folder, we will run our new flow by clicking its thumbnail and selecting Run > Run Flow	from its Action	menu. In the resulting pop-up, we&apos;re presented with a version of Leave Request Form	where the rules that would ordinarily be applied upon submission have already been applied. The Start Date	and End Date	fields are in error because the date provided by End Date	is not later than the date provided by Start Date	. A user seeing this form for the first time can tell immediately which values need to be changed in order for the form to be valid.